Modern Greek food fit for traditional full-to-the-brim feasting. Gringlish. That's how chef Philip Vakos and co-owner Stell Kaponas describe the cuisine at Bahari. A fusion of Greek and English, it's a concept that's certainly drawing crowds to their humble Swan Street restaurant. So don't let the seemingly modest space fool you — the food is anything but. Designed for sharing, the menu is best left in the hands of the staff who will guide you through from start to finish, and won't let up until you're happily sinking into a food coma. The chargrilled octopus with ouzo, lemon and oregano ($18.90) is a succulent starter and, if you're lucky, the specials for the day might permit a serving of prawn stuffed zucchini flowers: a clear standout. Moving through to main course, the slow roasted lamb shoulder with lemon, rosemary and garlic ($17.90) does what any good lamb shoulder should do: it falls apart at the nudge of a fork and then proceeds to melt in your mouth. The fasolakia — traditional Greek beans with onions, dill and tomato ($13.90) — is a welcome and tasty side, while the cauliflower and pomegranate salad ($13.50) is an appropriate nod to currently trending flavours in the Melbourne food scene. Some of the dishes are a bit heavily salted, but thankfully there's a dessert menu sweet enough to balance out the savoury (and an extensive wine list to quench your thirst). 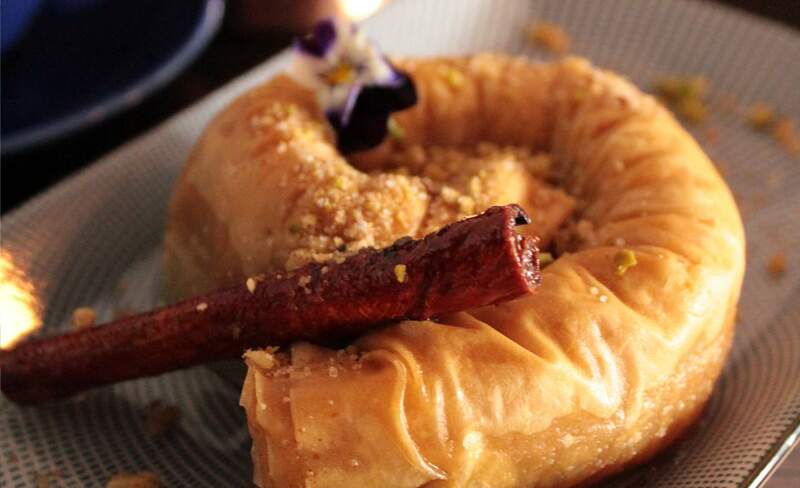 If you can pronounce it, the traditional galaktoboureko ($9) is the way to go. Think creamy semolina custard infused with lemon and vanilla, sandwiched between flaky sheets of filo. Yes. It's good, authentic food coupled with service from genuine people who just know that the best way to anyone's heart is through their stomach. The dishes are heavy, but in that satisfying, full-to-the-brim way — although, we'll be impressed if you're able to walk after this kind of Gringlish feast at Bahari.